Even with all the changes to Sin City - from the megaresorts, to the attractions, even into the evolution into LED lighting...Vegas is still the home of poker. The amount of poker tournaments that take place every day is unbelievable. The possibilities are endless, and can even get a little overwhelming for someone looking to have the ultimate gambling experience during their stay. Whether you want a full tour of every poker tournament or just want to check a hand of Texas Hold’em off your Vegas bucket list, we’ve gathered the best poker rooms for whatever adventure you choose. Whether you’re a seasoned veteran of poker or you think the only meaning of “Full House” is the 90s sitcom about Danny Tanner and his wholesome family, we’ve got the right poker tournament for you. One of the hottest spots on the Strip, ARIA Resort & Casino is a great first stop on your poker-tournament tour of Las Vegas. With a killer ambience, you can grab a drink at the bar and get ready for your big moment at one of their 24 tables. They’ve got three poker tournament structures to check out, from daily options to larger weekly tournaments. As a first-time poker player, you may be a little intimidated since the buy-ins tend to be slightly on the pricier side. But, MGM Resorts has an entire poker player’s manual that’s definitely worth a skim whether you’re new to the game or a pro. It can never hurt to brush up on the do’s and don’ts to take your game to the next level. 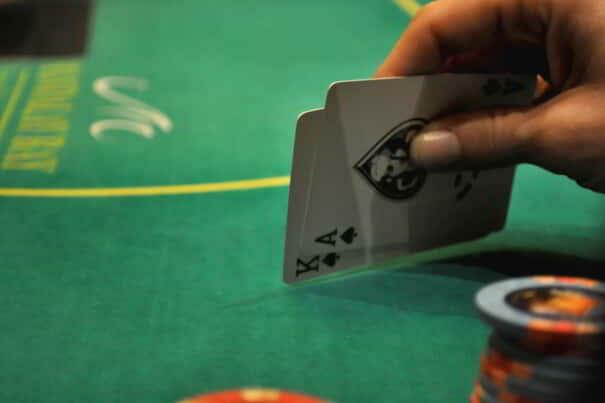 If a No Limit Hold’em tournament isn’t your style, ARIA also offers table games such as, Limit Hold’em, Omaha 8 or Better, Pot Limit Omaha, 7 Card Stud, Draw Games and Mixed Games all day, every day. So if you’re not really feeling the tournaments, but want to join in on the poker fun, ARIA has some great options to explore. If you’re ready for a serious poker tournament during your stay in Las Vegas, sunglasses and all, look no further than The Bellagio No Limit Hold ‘Em Shot Clock Tournament. This sole poker tournament at The Bellagio is held daily so you have plenty of chances to buy into one on your next trip. The 40 tables are held in a sleek 7,000 square feet space with two high-limit areas, one being the famous Bobby’s Room. 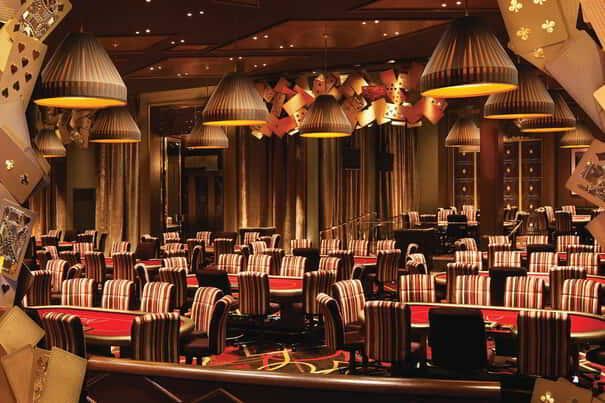 This exclusive, high-limit poker room houses two tables named after the 1978 World Series of Poker Champion and MGM Resorts International Chief Design and Construction Officer, Bobby Baldwin. What makes this smoke-free Vegas poker room even better is the 24-hour tableside dining with complimentary beverages. They’ll deck you out with poker gear like safe deposit boxes and a full-service cashier cage. To top off the ultimate poker experience, The Bellagio poker room features an overhead state-of-the-art music system, eight 32” television monitors and 11 42” plasma screens. Other games held in the poker room are Limit Hold’Em Pot Limit Omaha, 7 Card Stud and Mixed Games. The Excalibur Casino is the place to go if you’re looking to have the classic Vegas gambling experience without breaking the bank. 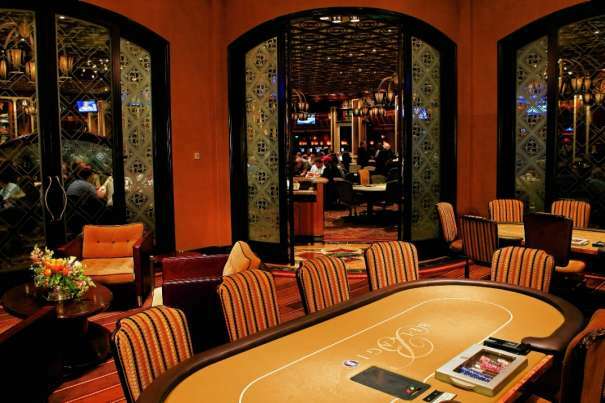 This hotspot is full of options, featuring four, daily poker tournaments in Las Vegas. Along with the variety of deals offered, Excalibur has additional poker tournament promotions. Win some extra dough between every ante with promos like Spin the Wheel for cash when you get Aces Cracked, Four-of-a-Kind or better. Get paid more for Four Deuces with a Pocket Pair. Dealt the almighty Royal Flush? They’ll pay you even more with the Regal Royals deal. You can’t afford not to play here! Mandalay Bay has all your favorite poker games, from Texas Hold’em to Crazy Pineapple and Omaha High. This spot is great for any level of poker player. They even offer free lessons if you’re a beginner or just want to brush up on your skills. Win your next game at one of the three daily No-Limit Hold’em poker tournaments. And get this: You can stay at the amazing Mandalay Bay Resort for a discounted rate as a poker player. Get in on the action at the Strip’s #1 hotspot for Texas Hold’em. The MGM Grand Poker Room is smoke-free and the perfect place for players looking for 24 hours of nonstop fun. In the morning, you can relax in the Poker Room with tableside massages as you get ready for the exciting night to come. With tableside food and beverage service, MGM Grand has 5 different tournament structures, offered daily with extra tournaments on the weekends. 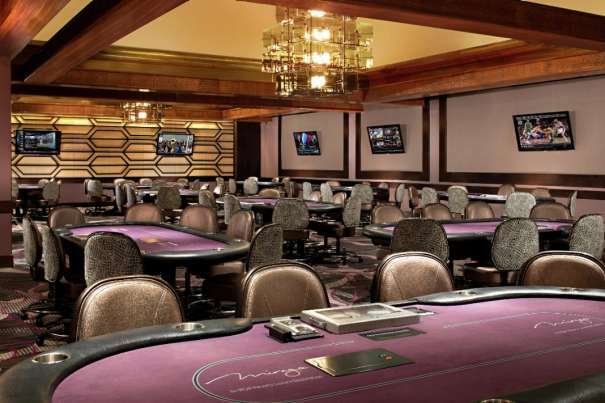 Named “Best Poker Room in Vegas” by Las Vegas Weekly, The Mirage Poker Room hosts a whopping 6 tournaments, 4 of which are held daily and aren’t too much of a financial commitment for those of you looking for mid-weight games. If you’re feeling pretty confident about your poker game and are looking for some higher stakes, The Stack Tournament is held on the weekends, with a slightly larger buy-in requirement.